Now here’s something you don’t see every day! You’ve seen mash-ups of a pro-touring Mercury Comet, but this one’s the ultimate combination of hot rod style and pro-style motivation. Robert Killian, you out did yourself! Robert Killian hails from Canton, Georgia. 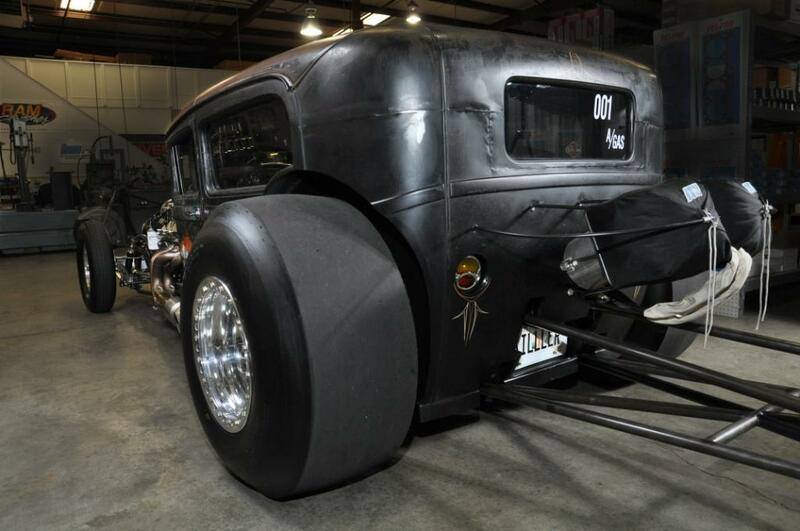 He’s been building hot rods for most his adult life, and he has always indulged himself in the unorthodox. But when contemplating Uncle Jed he told his chassis builder, “Let’s have one last adventure into the unknown. 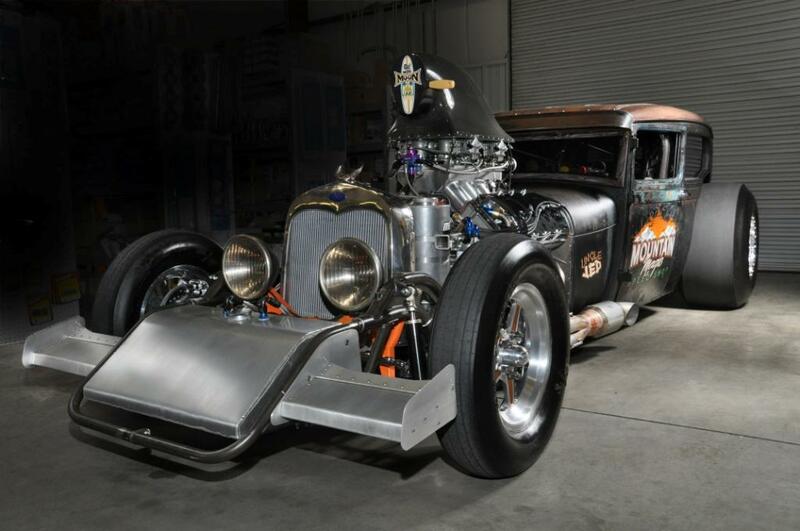 I’m reaching a point in my life (58) when I don’t anticipate foolin’ with 200mph cars much longer.” So this was how he approached his latest creation: a 1,900hp big-inch Pro Stock-powered road-legal Rat Rod. “Mind you,” said Killian, “I’m hesitant about calling Uncle Jed a Rat Rod because some Rat Rodders take offense. They’re adamant that it’s not low-buck enough, but obviously there’s not enough gleaming paint on it to call it a hotrod.” So its genre is uncertain. 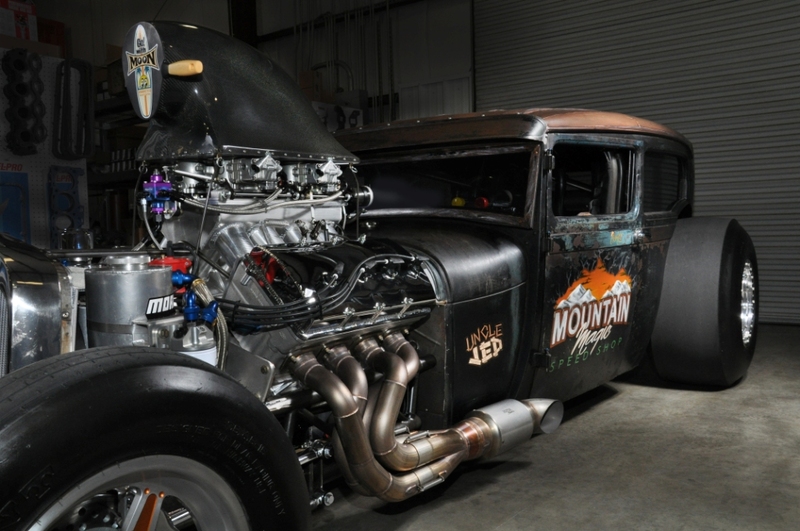 What is certain, however, is that Uncle Jed was constructed using a 1928 Ford Model A 2-door sedan body mounted on a twin-rail chrome molybdenum drag race chassis with a front-mounted 14-gallon fuel tank between its rails and wheelie bars at the back. Certified by the NHRA to run in Top Sportsman, the car has sufficient wherewithal and stability to run a quarter mile in 6.50 seconds at speeds in excess of 200mph. The chief reason for selecting a 1928 or ’29 cab is that each side of its narrow cowl steps out an inch or more to meet the door pillars. In so doing the cowl accentuates the impressive proportions of a Kaase 820cu in Mountain Motor. Mickey Thompson 33in tall x 10.5 x 16w rear tires mounted on 16in wide rims and 275 x 15in fronts on 3.5in rims are separated by Uncle Jed’s 130.5in wheelbase. To transmit the power, ATI prepared a special Powerglide 2-speed automatic transmission. Mark Williams handled the rear end requirements with floater axles and carbon fiber discs and pads. Work on the center section of the roof was completed by substituting a sheet metal pressing from a Dodge Caravan for the original canvas top. In the original design, fabric with a layer of cotton was stretched over a span of chicken wire supported by wooden struts. 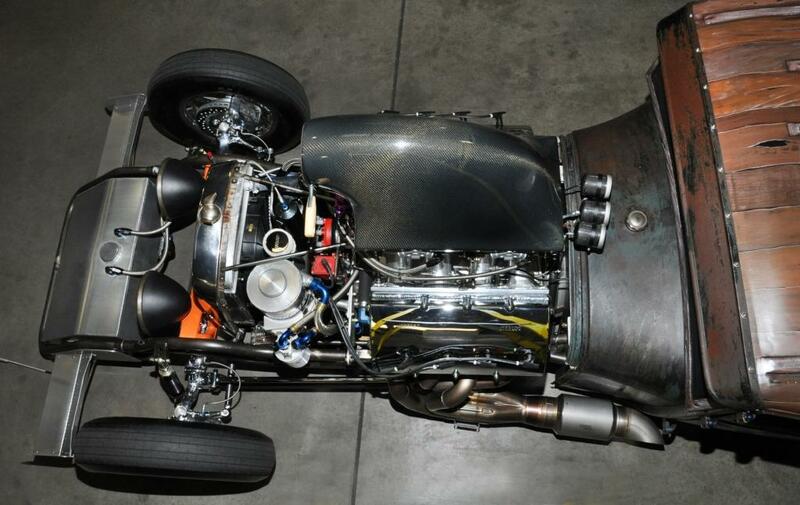 Jon Kaase Racing Engines, Inc.
That is one cool hemi rod..